Look around the Aspiring Village on any given day, and you’ll see plenty of residents out walking, biking, pottering in their gardens and heading to the Lifestyle Centre for a swim, or to enjoy the company of others. Look further afield up the nearby ski slopes and you might see a few more residents enjoying the snow – either skiing or sightseeing. 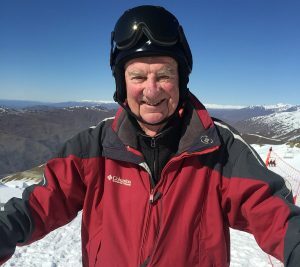 The one place you wouldn’t expect to see an Aspiring Village resident is lined up at the start of a ski race – but that’s exactly where you would have found John Perkins this winter. In fact, he won the 80-85 year Masters race at Treble Cone, though he is quick to point out there were no other entrants! 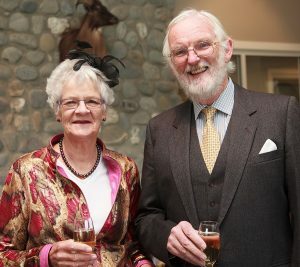 After starting their married life in Rangiora and blending their two well-matched families (both had a daughter and son from previous marriages), they moved to Lake Hawea in 2003. “I grew up in this area,” said Judith, “and we wanted to come back to support my mother in her later years. We bought the section next door and established a B & B – something I had always wanted to do.” The former Hotel Receptionist was great at welcoming the guests and making them feel at home, while Quantity Surveyor Ian was in charge of cooking the perfect breakfast and taking care of maintenance. .
Their motivations for moving into the village were slightly different – for Judith it was the chance to be part of a community. “I love the diversity of people that live here – from all walks of life – including my sister who lives just down the road! Our morning teas are a great way to connect with people – and for others Happy Hour does the same thing.” For Ian, it was the freedom from maintenance – “they do everything for you here” – which has given him time to improve his fitness, working out in the gym three days a week, and swimming three days a week as well. “I still have time to do a little work for a QS firm in Christchurch – which helps top up the travel fund.” Ian has set up a very tidy and organised office in his garage which makes that very easy.